Something about the abundance of cherries at the market triggered a compulsion to pair them with scallops. It was a strange urge, as I'd prepared scallops exactly once before, years ago, and overcooked them horribly. It's an appealing presentation for kids who may be unsure of scallops. Two of the four kids liked it, and one more at least tried it. We enjoyed this as an appetizer, but it also makes a great summer entree. The scallops need half an hour in the refrigerator before cooking, but total time on the stove is just a few minutes. 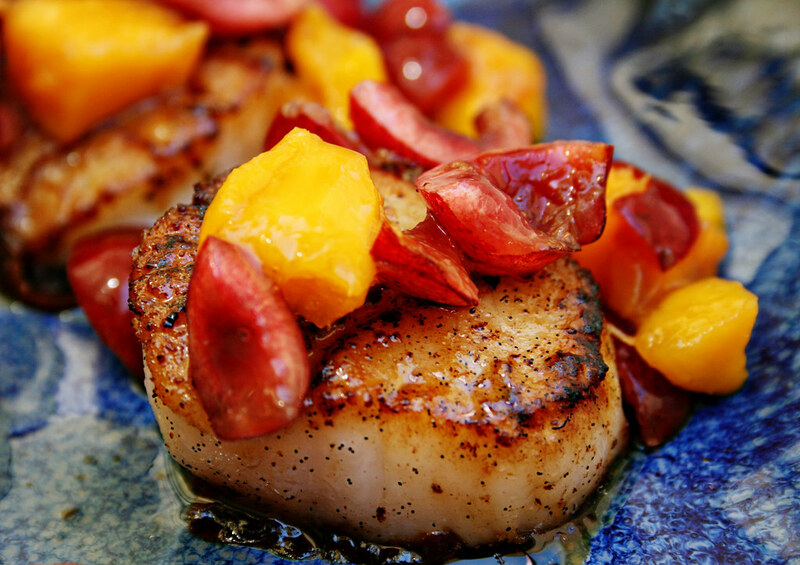 Topped with fresh fruit, these scallops are a lovely light summer meal. This recipe serves 4 as an entree, or 8 as an appetizer. If you've made compound butter with vanilla, you could substitute that for the separate butter and vanilla here. Rinse scallops and pat dry. Set on several layers of paper towels and put in refrigerator, uncovered, for 30 minutes to allow scallops to dry. Combine mango, cherries and tomato in a bowl; set aside. When ready to cook, spray a non-stick pan with olive oil, set it over medium-high heat, and add butter. Split vanilla bean lengthwise with a paring knife and scrape vanilla seeds into the pan (or add extract, if using). Season scallops with salt and pepper and set in a single layer in the pan (you might need to cook this in two batches if your pan is small). Cook 2 to 3 minutes, until bottom of each scallop is nicely browned and releases easily from the pan. Turn scallops over and cook another two to three minutes. Arrange cooked scallops on a platter and top with fruit mixture and remaining butter from pan. Sprinkle lightly with sea salt and serve immediately. Love the photo - and the tip for how to dry the scallops! (I've always had trouble getting them to brown properly). Looking forward to trying this. This is gorgeous. I absolutely adore the pairing of scallops and vanilla. Can't wait to make this. It was a most delightful appetizer! Adding scallops and vanilla beans to my next grocery shopping list. Glad you're all inspired! I'd love to hear back how you enjoy it, and especially how you tweak it yourselves. Yvonne, I recommend checking out Saffron for buying vanilla. 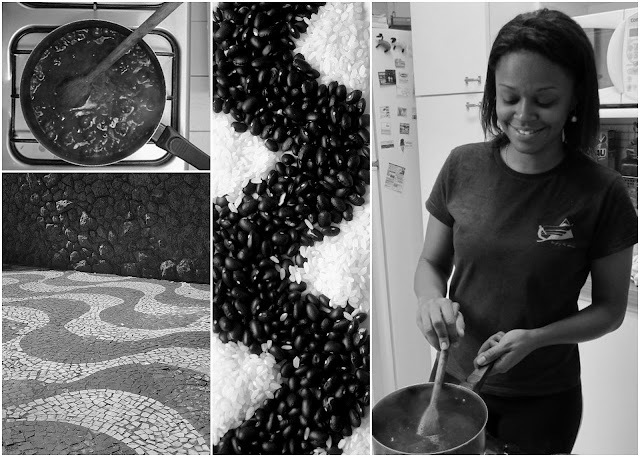 A pound of great beans for $20 -- really. I love the photo! The colours are amazing. Will definitely try this recipe! you won!!!!!!!!!!!!! Love the recipe and the photo is gorgeous. Will have to make it once I find some free time. Please email me your address and I'll send you the gift cards. Thanks so much, Olga! I'm glad Anna pointed me to your site -- loving mangoes and tomatoes these days!